Melons prefer soils with high humus contents, good structure and corresponding water retention capacity. Melons love warmth, and need a lot of nutrients and water. Melons are susceptible to foliar diseases (mildew) in areas with high humidity and mist formation. Ensure adequate nitrogen and phosphorus supply at the beginning. Emphasise potassium fertilization after the first harvest. Fertilize boron under dry conditions. 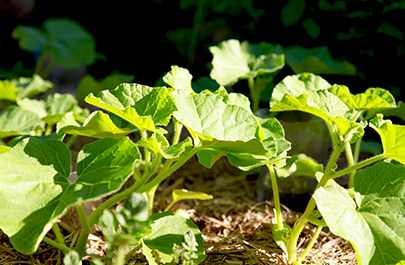 Melons are heat-loving plants but do not tolerate excess moisture, which causes fruit rotting and sick leaves. 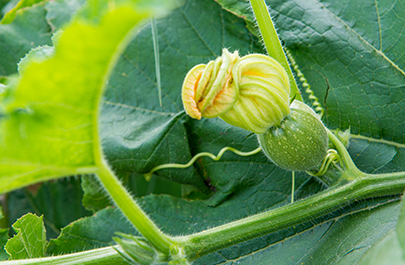 Melons are susceptible to mildew and viruses like all plants in the pumpkin family. Varieties with resistance or tolerance to diseases are available. Therefore, outdoor cultivation is only possible in favourable locations. In unfavourable growing conditions and for season extension, melons are produced under foil or glass. In sheltered cultivation, much higher yields are achieved compared to outdoor cultivation. 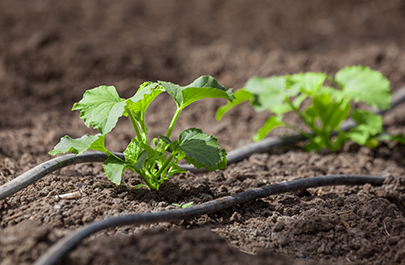 Due to their shallow root system, melons need a regular water supply. The shoots are often cut for better fruition. Melons are highly nutrient-consuming and need large amounts of nutrients through balanced fertilization. Nitrogen must never be omitted during plant growth. Melons react well to phosphorus and potassium fertilization at the end of the growth stage and during the maturity phase. Melons are constantly in great need of nutrients and absorb large quantities of water. A deficiency in phosphorus can reduce growth and formation of flower buds severely. Phosphorus deficiency causes short stature of the plant and a shortening of the internodes. Potassium is essential for sugar production, and subsequently improves the quality. It significantly reduces the risk of fruit bursting and increases the weight of the fruit. Melons are sensitive to molybdenum deficiency, especially on cold, wet and acidic soils. The plant is also sensitive to manganese and iron deficiency. Boron improves bursting strength (fruit cleavage) in dry years. The table shows the uptake and withdrawal per tonne of melon yield. Melons mainly need nitrogen and potassium. Phosphorus, magnesium and calcium must also be present in appropriate amounts. For example, melon yield of 50t/ha takes up 200kg N/ha. Those 200kg N/ha are normally all added as fertilizer. With respect to the harvest quantities, the entire 200kg N/ha are removed from the field. 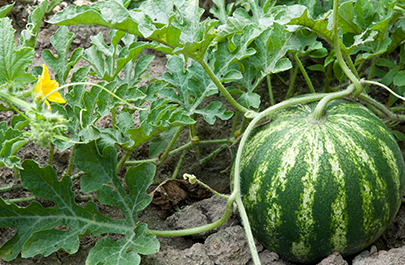 Under suitable conditions, high-yielding melon varieties are expected to produce 50 tonnes per hectare. While to fruit ripening on older parts of the plant, the plant continues to grow. Fertilization should therefore support sustained growth and at the same time fruit development with high market value and good taste. The nitrogen supply must be sufficient for as long as growth continues. However, it is important to avoid an excess of nitrogen as it increases susceptibility to foliar diseases and fruit rot. High quality (taste, colour, firmness and shelf life) can be achieved by sufficient phosphorus and potassium levels. The maintenance of the necessary potassium supply is essential for fruit formation and fruit enlargement. Melons are sensitive to chloride. Potassium chloride is therefore only used in the autumn prior to cultivation, while potassium sulphate should be used during the growing season. The optimum pH of the soil is between 6 and 7. Calcium should be applied in autumn before planting. As a guideline, 1500kg CaO/ha as magnesium-heavy lime can be used. On acidified or cold and wet soils, fertilization of molybdenum is essential. Under dry fruit growing or fruit ripening conditions, melons need additional fertilization to prevent the fruit from bursting. It is necessary to split the applications of fertilizer; a portion is applied before laying the mulch foil, the rest is used to re-fertilize during the crowing period in several doses, sometimes only in the row. In protected cultivation, fertigation facilitates the use of different fertilizers at different growth phases and an adaption of fertilizer quantity to demand. Plants per m² and a continuous production of flowers and fruits determine the yield formation. The supply of nitrogen and a constant amount of phosphorus are important, especially at the beginning. Beautifully formed melons with good colour and a sweet taste can only be achieved with sufficient potassium. Planting until first fruit growth, starting with phosphate-rich fertilizer. At the beginning of growth, the plants need relatively small amounts of fertilizer. Meagre fertilization and restrained irrigation increase root mass formation. Therefore, only about 8% of the nitrogen and 3% of the potassium requirement, but already 40% of the total phosphorus are allocated until the first flowering. First fruit batch to the end of fruiting - Balanced nutrition for flowering and fruiting. Continuous growth, flowering and fruit formation has to be sustained at the same time. Therefore, particularly balanced nutrient ratios are necessary. Around 70kg N/ha, 40kg P2O5/ha and 120kg K2O/ha are administered at this stage. The magnesium and calcium supply should be given special consideration at this growth stage. The fruit growing phase is the main fertilization phase. For the formation of the first fruit, the plants need fertilization with nitrogen (about 80kg N/ha) and potassium (about 120kg K2O/ha). Poorly formed fruits with a bad taste are the result of nutrient deficiency during this phase. Continuous fruit formation and ripening needs increased potassium fertilization. A chloride-free, concentrated, multi-nutrient fertilizer application of approximately 70kg N/ha, 25kg P2O5/ha and 130kg K2O/ha ensures the nutrient supply in the last fertilization phase. Melon fertilization can be stopped approximately two weeks before the end of the harvest. The last fruits then ripen with the nutrients still present in the plants.